Two girls. Four centuries. One curse. Isabella started it–all because a boy fell in love with her–but it ends with Sarah. They meet in secret, Isabella and Thomas, during the witching hours while the rest of the villagers hide behind locked doors. And even though she’s scared, she wants Thomas more. He’ll protect her from the night, from his father who’ll decide her future, from the paranoia-fueled hunting parties taking away innocents. Centuries later, seventeen-year old Sarah runs away to an aunt she never knew she had. Her dad? Dead. Her mother? A liar. All she wants is memories of a father she never got–memories her mom refused to give her–memories she is determined to get from her aunt, her father’s journal, and a town full of crazies. What she discovers is her father’s death isn’t as innocent as everybody claims, and everyone–the Wiccans, the townies, even her quasi-boyfriend–all seem to be hiding something. The secret the history-rich town lives to keep entangles Sarah into a centuries old witch curse. Isn’t it made of awesome! I could not be happier. Seriously. Evernight Teen’s cover artist did exactly what I wanted. For the occasion, here’s a never-before-seen excerpt from Blood Hex! I took it all in. Giant banners announced “Adams Colonization”, eerie witch posters and mannequins with stringy green hair and large, red eyeballs stared back. The guards along the stage dressed in old brown suits and hats I guessed were supposed to be replicas of what the first settlers wore. The costumes reminded me of pilgrims. They stood at attention, faces impassible as they monitored the crowd. The picture sank into my brain, this parallel reality where past met present in a jumbled mesh. No wonder why she said she was too busy to hang out with me. I snuck forward a little, caught up in the surprise appearance of Rose. The arm that had been touching Drake instantly chilled. He was so nice. And cute. But the reason why I came here was up on that stage. Rose’s voice rang out, low and seductive. “On this day in 1610, our ancestors inhabited a foreign land. Today, we call that piece of land Adams, Virginia.” Scattered applause swelled through the park. “Our ancestors brought with them superstition…and fear from England. Men and women, children—all terrified of one thing.” Rose’s hypnotic voice was mesmerizing and I leaned forward even more. “Witches.” The stare of an old, wise woman lingered over everybody and when her eyes met mine, a pool of black reflected the licking orange flames. Rose motioned to the side of the reaching flames. Two men in the ugly brown trousers and jackets nodded. “During this opening ceremony, we will conquer fear as they did back in the old days.” The men pulled at ropes, hoisting a cross into the air. Mounted to the cross beam was the body of a woman, her mouth agape in horror. I drew in a sharp breath. I felt Drake move next to me so I turned my gaze on him. A sly smile graced his face. He put his arm around me, pulling me closer. “Are you scared?” he whispered. I couldn’t speak. These people were freakin’ crazy. My eyes darted through the crowd, looking for a policeman—somebody—who might stop this. “Don’t worry. We always do this on opening night,” Drake said, pulling me even closer, rubbing my shoulder with his hand. I wanted to scream at him to do something, to help the poor woman. He only sat smiling, eyes bright with anticipation. I knocked his hand off me and pulled away, but before I could wiggle free of Drake’s arms and run to the fire pit, the cotton clothes the woman wore caught fire from the reaching flames underneath. My breath clogged my throat. I didn’t know whether to scream first, or cry. The flames spread fast. The waistline already edged with black char before the fire incinerated it. Dark gray smoke furled over the helpless woman and puffed up toward the blood red sky. 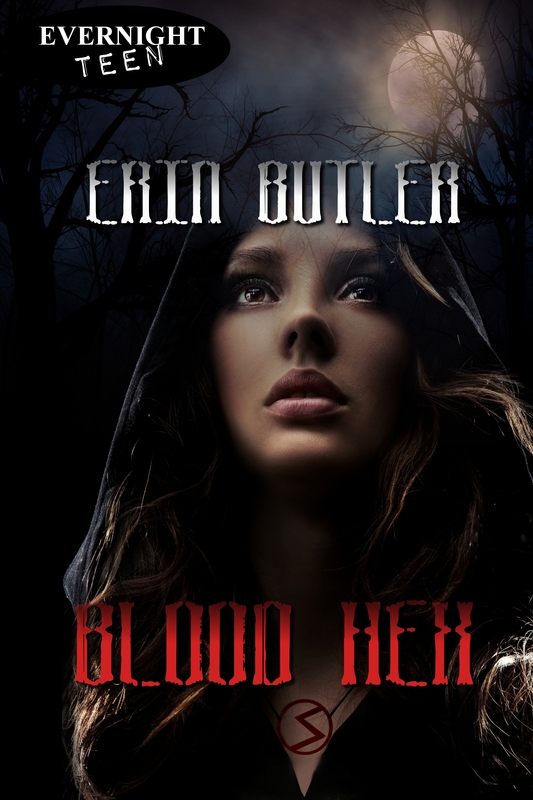 You can add Blood Hex to Goodreads here! Posted in Blood Hex and tagged Blood Hex, cover reveal. Bookmark the permalink. I’m a guest at Evernight Teen’s Blog today! I’m a guest poster over at Evernight Teen’s blog today talking about doing the impossible. Check it out by clicking the picture below! Posted in Blood Hex, Evernight Teen, Guest Post and tagged Blood Hex, Evernight Teen, Guest Post. Bookmark the permalink.